The economy bounced back in 1939, which meant higher sales throughout the industry. Pointed fronts reappeared on most of this year's GM cars, and the 1938-1939 Sixty-Special Cadillac was no exception. Cadillac's new ensemble was a three-element affair consisting of a slightly raked, prow-shaped vertical radiator flanked by grilles in the "catwalk" area between the front fenders and the main nose section. Above the catwalks were headlamps repositioned higher and closer to the central grille. The Series 60 was replaced by the 126-inch-wheelbase Series 61, offering the same body types and many of the Sixty-Special's appearance features. Common to all 1939 Cadillacs were a redesigned dashboard, newly optional vacuum-operated radio antenna, rubber rear fender protectors, and something called "Controlled-Action Ride," a reference to a higher rear axle rotation center claimed to enhance ride comfort. Aside from this, the Sixty-Special Cadillac was largely unchanged, presumably on the grounds that it didn't pay to fool around with a winner. The policy paid off, and once again it was Cadillac's single best-selling model line. However, the series was expanded for 1939 with two variations of the basic four-door: a sunroof sedan with a sliding section above the front seat area, and a limousine-like Imperial Sedan with division window as well as the sunroof. 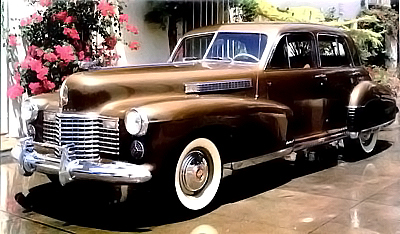 The near perfect Sixty-Special Cadillac saw subtle changes for 1939-1940. A gorgeous Sixty-Special coupe had been built as a one-off for GM president William S. Knudsen and four convertible sedans were built experimentally for the use of other high-level execs, but neither model reached production. Chairman Sloan may have hinted at the rationale for only one basic body style when he noted that the Sixty-Special was "well received in the market and demonstrated the dollars-and-cents value of styling, for customers were ready to take smaller trade-ins [dollar amounts] on old cars to acquire it." Two more versions of the basic sedan appeared among Sixty-Special offerings for 1940, and all models now carried Fleetwood instead of Fisher bodywork for the first time. The Imperial Sedan could now be ordered without the sunroof, and a new Town Car style was added in both steel -- and leather-backed forms -- at a hefty surcharge over the standard version. Styling on all Cadillacs stayed mostly the same except for heavier horizontal grille bars, slightly less restrained use of bright metal and, along with most other American cars that year, standardization of sealed-beam headlamps. Arriving in the price bracket just below the Special was the new Series 62, a replacement for the Series 61 featuring two predictive "torpedo" body styles fresh from the Art & Colour studio, a sedan and a five-passenger coupe. The Series 62 stole some of the Sixty-Special's thunder. Another Bill Mitchell design, it employed GM's new C-body, with lines obviously inspired by the Special. This together with prices that were some 16 percent lower enabled the 62 Special to oust the Special as Cadillac's volume leader for 1940. In the next section, learn about Cadillac's "contemporary" 1941 model lineup.